Tales from a Free-Range Childhood is an Okra Pick! …a well-told true story is comfort food for the soul, and Davis’s book [Tales from a Free-Range Childhood] is nourishing. Just in time for the official release date (tomorrow! ), Donald Davis’s Tales from a Free-Range Childhood has been selected as a 2011 Spring Okra Pick from SIBA in the nonfiction category. The Okra Picks are a dozen fresh titles, or “great southern books, fresh off the vine,” chosen each season that SIBA Indie Bookstores want to handsell. Donald Davis, considered to be the father of family tales, has been a nationally renowned storyteller for more than 20 years. And Tales from a Free-Range Childhood is “a seamless transition from oration to the written word,” according to ForeWord Reviews. Earlier this month we posted a Valentine’s Day story from the book. Today we’re offering a different excerpt: a hilarious tale called “Look It Up!” where Davis explains why 28 second-graders petitioned the school board to reestablish paddling as their preferred form of punishment, instead of the new policy of “suspension.” Enjoy! Check back tomorrow for a Q&A session with Donald Davis himself! The long list for the 2011 SIBA Book Award has just been released by the Southern Independent Booksellers Alliance. The long list includes more than seventy-five books representing bookseller and reader favorites of 2010 in fiction, nonfiction, poetry, children’s, young adult and cooking categories. The Long List is the ultimate southern reading list from the people who would know—southern indie booksellers. And congratulations to Hub City Press and Eno Publishers for making the cut! We’re thrilled to share that Lou Dischler’s My Only Sunshine, Tim Peeler’s Checking Out, and Michael Malone’s 27 Views of Hillsborough are on the list. In the sulky summer days of a Virginia Eastern Shore town, a current of guilt and repression flows beneath the placid surface of respectability. In this year after his mother’s death, with girlfriend problems and his father’s flirting with a new romance, 16-year-old Isaac faces not only the mysteries of his coming of age but also the mysteries of a twisted communal past. A summer job at Chum’s Hardware introduces Isaac to Crazy Eddie, an acerbic 82-year-old who is outspoken about everything except the string of bizarre vandalisms pulling down big headlines in the weekly paper. Someone is flooding the houses of Rooksville’s leading citizens and leaving a signature of painted flames on the walls. A clutch of self-righteous vigilantes who gather at the hardware store offers a $5,000 reward for the conviction of whoever is responsible—and they have their eyes on Isaac. Isaac quickly discovers that small towns where everybody knows everybody else’s business often hide the most vicious secrets. A lost ledger at Chum’s and the unmoored rantings of the town’s recluse about the Klan are the first clues to the unexplained puzzles that swirl like dust motes at the hardware store. By laying bare the stains of history and facing down the town’s hatemonger, Isaac resolves the question of where he belongs in the world. Be sure to read more about Mercy Creek and Hub City Press in our last post. Did you catch Hub City Writer’s Project on Whad’ya Know? this weekend? Host Michael Feldman spoke with Hub City executive editor Betsy Teter and Deno Trakas about the project and its mission on the show. If you were listening, you probably heard her shout-out to her distributor, John F. Blair, Publisher! If you missed the show, you can listen to it online (Betsy and Deno chat with the host around minute marker 11 in part 3 of the Feb. 12, 2011, show). Modeled after Roosevelt’s federal writers’ project, Hub City works to support and promote emerging authors and preserving the collective memory of Spartanburg, S.C., where the organization is based. Hub City covers everything–the staff train writers through workshops, publish writers through the Hub City Press, and then sell the books in their bookshop. In 15 years, Hub City has published more than 300 writers, sold some 70,000 books, renovated two historic downtown buildings, and given away more than $15,000 in scholarships to emerging writers. It has won South Carolina’s Elizabeth O’Neill Verner Award for the Arts, the SC Governor’s Award for the Humanities, and three first-place IPPY (Independent Publisher) Awards. Want to learn more about the kind of work the press publishes? 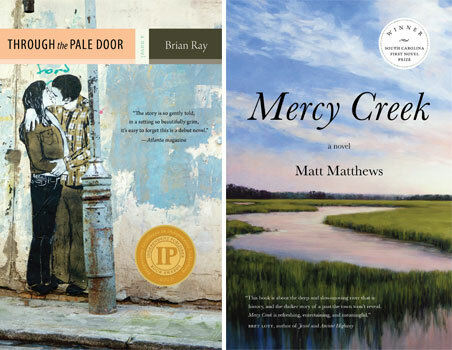 Check out their two spring titles: Brian Ray’s Through the Pale Door (now available in paperback), and Matt Matthews’s Mercy Creek. Happy Valentine’s Day from Blair! We thought this would be the perfect time to share with you one of our favorite chapters from Donald Davis’s Tales from a Free-Range Childhood: “Up Her Sleeve.” This story follows the author’s Valentine’s Day adventures through primary school in the 1950s, although this tale will have you remembering the first valentine you ever received, whether you grew up in the 1950s or the 1990s. The book will be officially released March 1, so I hope this sweet story will hold you over until then. Yesterday we introduced you to Mike Marsh, author of Fishing North Carolina. The book hit store shelves last week and is available at your local bookstore, through online booksellers, at blairpub.com, and on Mike’s own Web site. Fishing North Carolina is the guide for fishing at watering holes across the state, so if you have any plans to fish in North Carolina this spring, you’ve got to own this book! And for all you fans out there, we’d like to share a little interview we had with the fishing expert. Enjoy! Q. How long have you been fishing (and writing about fishing) in North Carolina? A. I arrived in North Carolina in 1963 with my family. I was 10 years old and was fishing local farm ponds at that age, either by myself or with a friend. I began writing Quest for the Limit – Carolina Hunting Adventures 20 years ago. It was my first attempt at writing and it took several years to complete the book. It was published in 1995. Since that time I’ve written about 6,000 magazine and newspaper articles. Q. What’s your earliest fishing memory? A. I remember catching my first fish when I was three or four years old. We were fishing in a pond on the Iowa State University campus, where dad went to college after he was discharged from the Navy. He tied me to a tree with a length of clothesline rope so I wouldn’t fall in the water. My older brother, Curt, and I caught bluegills so fast that Dad never got a chance to bait his own hook. Q. What were some of your most memorable or surprising catches? A. That’s a tough question because there have been so many. I landed a 5-foot tarpon in the surf of Masonboro Island. At the time, it was the only tarpon I had heard of being landed from the surf. My wife, Carol, was with me at the time and that made it a special experience. It jumped many times and ran off all of the line twice before I had the fish under control. The 40-pound red drum on the cover of Inshore Angler was landed on eight-pound test monofilament line and took 45 minutes to bring to the net. It was July 4th weekend, and the boat traffic was heavy. An angler kept the boats away from the line, then boarded my boat to take the photo that became the book cover before I released the fish. The first fish I ever caught by myself was a bullhead catfish. I put it in a pot and rode it home on the handlebars of my bicycle to show it to my dad before I rode it back to the river and released it. When I first started dating my wife, I caught 8 bass from a golf course pond (the bass limit was higher back then; it’s five fish today). Carol took a photo of me with my catch, the first photo every taken of me with fish. She still has the photo. Now, I have about 100,000 images of myself and other anglers with dozens of species of fish. Q. What’s your favorite fishing spot? A. That’s impossible to pin down because there are so many. I like fishing at Lake Waccamaw because the lake is so beautiful and it has good fishing for many species. I consider the Cape Fear River, all of the southern inlets, and ocean waters far out into the Atlantic Ocean as my “home” waters for the same reasons. Q. Would you rather fish in a river, lake, or on the ocean? A. I really don’t care if it’s a lake, river, or the Atlantic Ocean. All water bodies have their own unique challenges and hallmark fish species. The coastal waters have an abundance of large, aggressive species, but wind or other weather conditions can make fishing difficult or unsafe in coastal waters. When the wind is blowing, I can always find a spot to fish in a pond, lake, or river that is out of the wind and weather. To generate the volume of articles I must to feed my newspaper and magazine markets, I must constantly be on the lookout for new opportunities and it really doesn’t matter to me where they occur. Q. What’s your favorite seafood dish? A. My favorite seafood dish is fried flounder, especially when the fish has been caught the same day. That’s as fresh as seafood gets. Q. Ever read a book that changed your life? A. Robert Ruark’s The Old Man and The Boy changed my life. My father placed a copy of that great work of sporting literature on my bed as a gift for my thirteenth birthday. I couldn’t put the book down until I had read every word. That book made me decide to be an outdoor writer, despite many people who tried to dissuade me because of the many challenges. But, although there were some detours along the way, I have made writing about the outdoors my life’s work. It can be a very difficult profession, but it can also be very gratifying. Little did I know that twists of fate would find me fishing and hunting in the same places and for the same species as Ruark and that I would have friends that actually knew him as well as the people in his life, including The Old Man. One of my best friends was a Cape Fear River pilot, which is the same occupation as Ruark’s Old Man. Other books that had big impacts on my life include The Yearling and Death in the Long Grass, by Peter Hathaway Capstick. Death in the Long Grass is one of the finest pieces of sporting literature ever written and it also inspired me to write. Q. If you could meet any author, living or dead, who would it be? Thanks to well-known fishing expert Mike Marsh, North Carolinians finally have a definitive guide for the entire state in one handy volume. Fishing North Carolina is the only book that covers the multitude of fishing opportunities in all of the state’s regions: mountains, Piedmont, and coastal plain. Whatever type of fishing you prefer, Fishing North Carolina has something for beginning and advanced fishermen, longtime North Carolinians, newcomers, and tourists alike. This book will tell you where to go, how to get there, what fishing regulations are in effect, the best time to fish, the best way to fish (from boat, dock, or shore), key species at each locale, and the best lures to use. Sixty detailed maps, descriptions of the fishing, and general information about the locations will help you know whether or not to expect snagged lures or an enjoyable fishing experience for the whole family. Mike will be celebrating the release of Fishing North Carolina in Wilmington, N.C., this weekend. Join him Saturday, February 12, from 1 to 3 p.m. at Barnes & Noble, located at 850 Inspiration Drive. Pack up your fishing rods and bait; you’ll want to hit the open seas–or lakes, ponds, rivers–after speaking with him.